Got 20 minutes in your day? Then whip these up for your porch! I scored a few very cheap end-of-season clearance pots at the local department store. These are already colorful plastic, but I wanted to dress them up a bit to use on my little back porch along with my other Autumn decorations. This craft project literally took me about 20 minutes excluding dry time to do four pots. 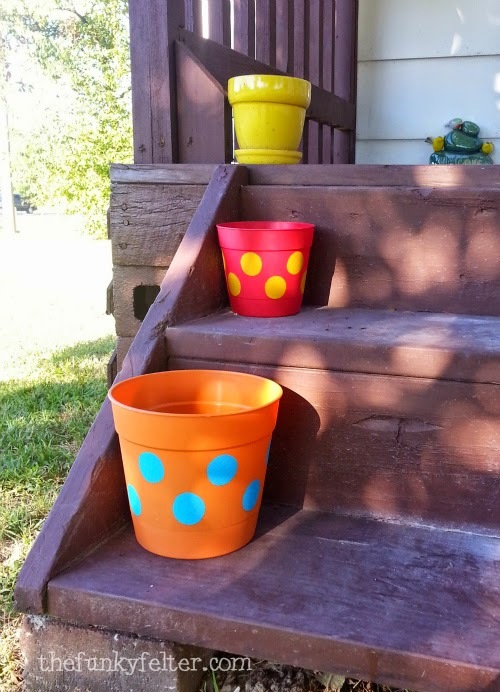 It was an inexpensive and simple way to dress up my porch steps. Now I just have to find something to fill my pots...on to the next crafty adventure for a later post. First, be sure the surface of your pot is clean. You can use a little rubbing alcohol if necessary to remove any oily or chemical substances and then let it dry well. Apply a very liberal but even coat of paint to your foam spouncer. At a straight angle, press it against the surface of your pot. Then very gently rock it from side to side and up and down, never lifting it up off the pot's surface. This will help the paint to adhere around the edges for even coverage. Then lift straight up and you're done. The paint will look thick and perhaps have some little bubbles, but that's what you want so it dries with even coverage. Re-coat the spouncer and do the next dot. If you mess one up, have a damp cloth ready to wipe it off the surface quickly and redo it. Don't wait to long, and don't try to just reapply over the top as it is hard to align your spouncer once it has been lifted. I recommend wiping the funky dot away completely and doing it over. Apply as many dots of any size and color you like on the surface. If using outdoors, you might want to coat your planter with a clear sealer of some kind. I didn't do it for this particular project, but I have in the past and it is useful for slowing down wear on painted surfaces.